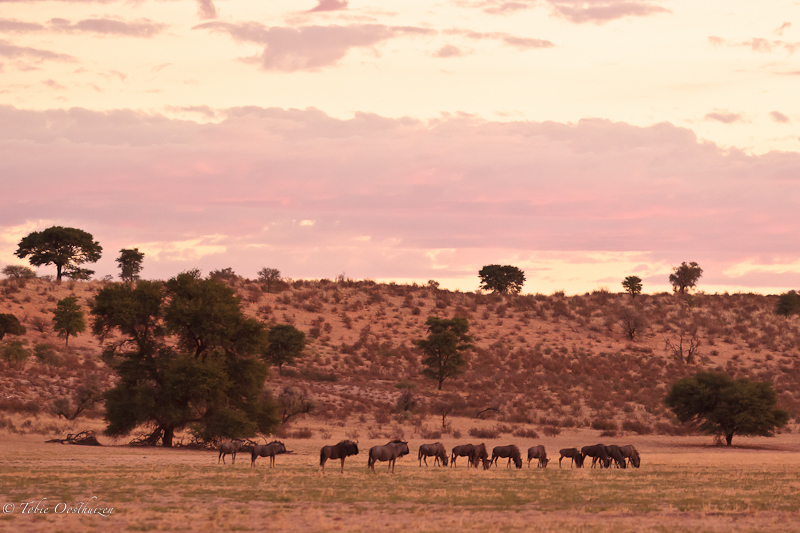 Sitzas was quiet and I continued towards one of my favorite waterholes, Craig Lockhardt. As I approached I saw there was something drinking. 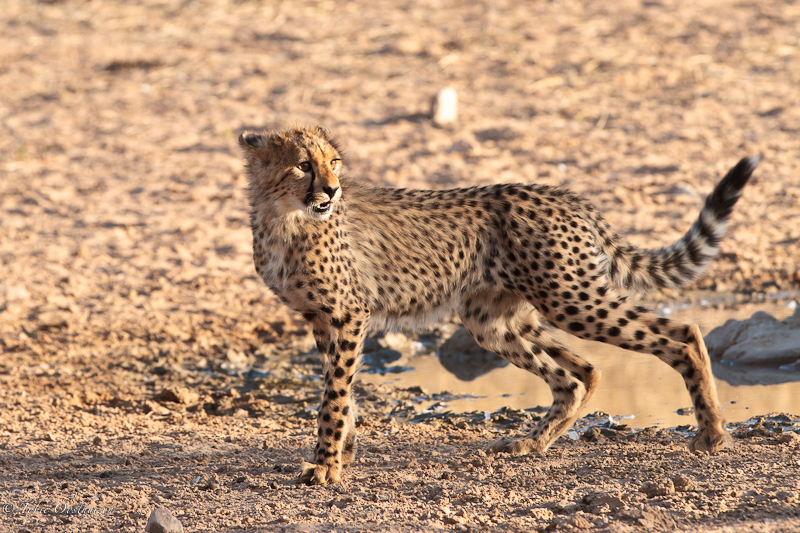 It was my Cheetah mother with the 2 cubs (from whom the Lion stole their Springbok kill a few days ago). 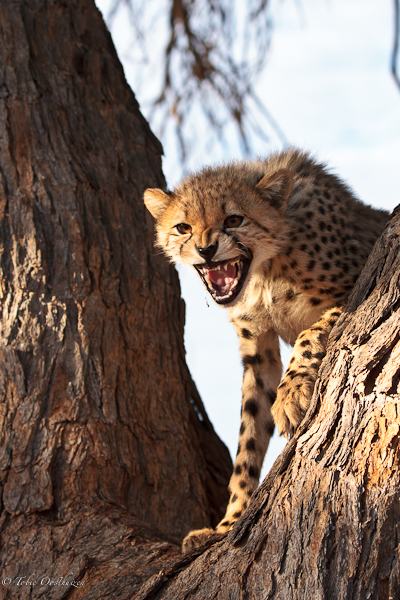 I parked under the tree close to the waterhole and the Cheetahs were very close. 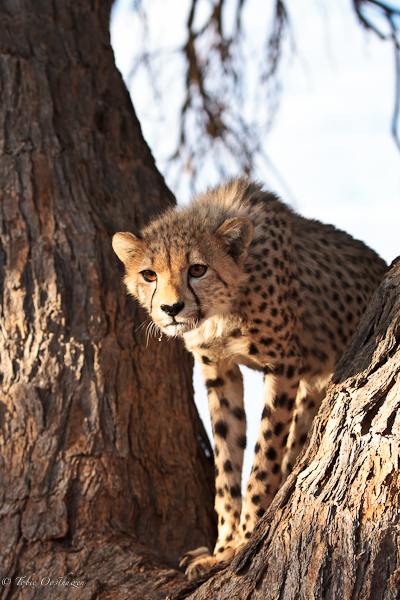 The one cub climbed into the tree at the waterhole. As it was peeping through the fork in the tree it must have seen it’s reflection in my car window and growled at itself. 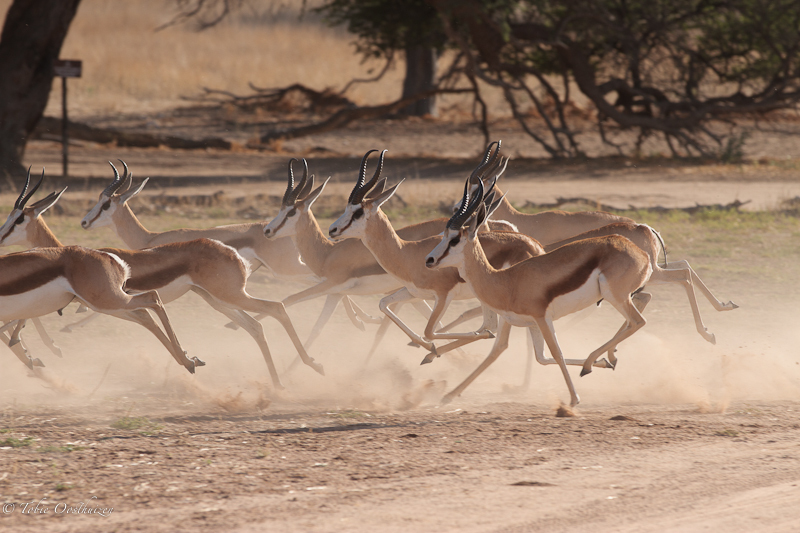 Eventually mother spotted some Springbok towards Dalkeith and she moved off into the dunes. She was probably going to try and stalk them from behind the dunes and I decided to drive along and wait next to the Springbok to see what will happen. 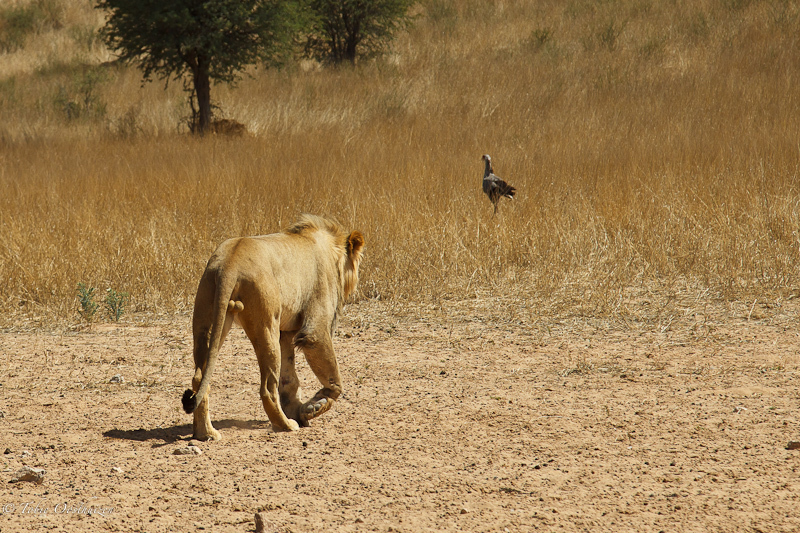 I lost track of them but then suddenly a male Lion came walking along the river towards us. 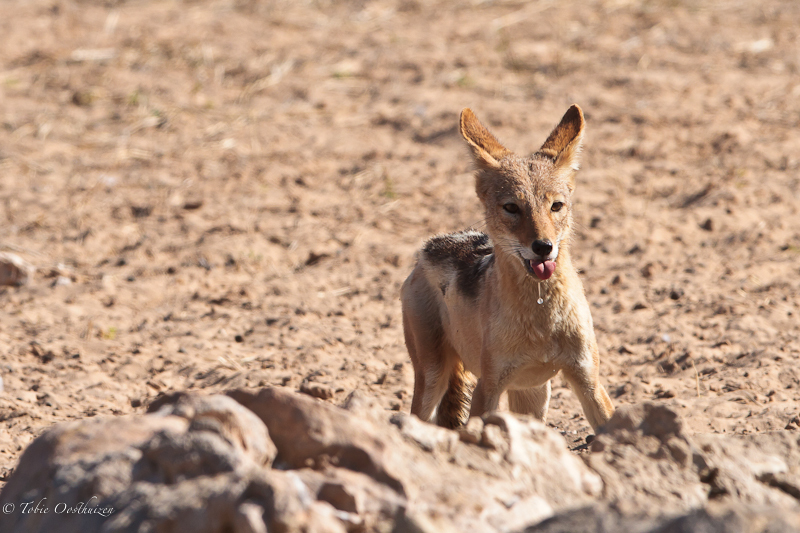 This spooked the Springbok and at the same time the Cheetah charged from the dune. 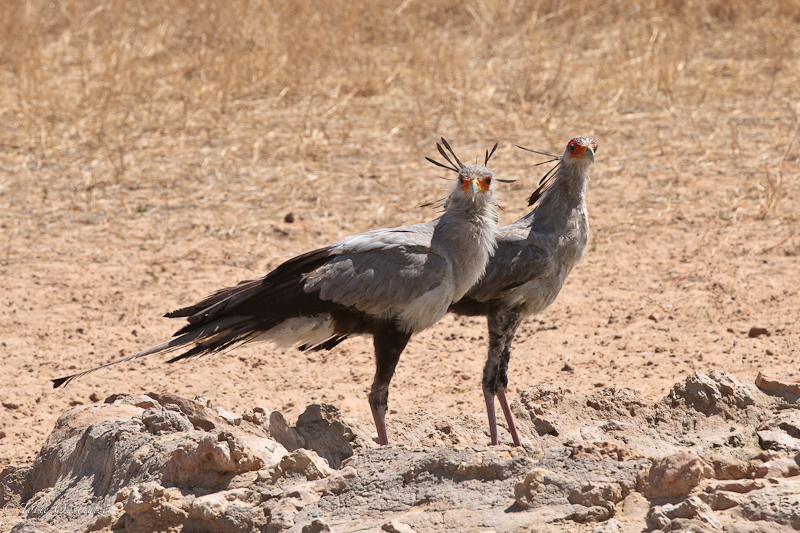 This caused pandemonium with Springbok scattering in all directions. but to my surprise plonked down in the shade of the tree a few yards from my car and started grooming himself! After a while he moved to a different spot (now behind the logs packed as a barrier for the cars). I was still convinced that he will eventually have to come for a drink and therefore decided to stay put. 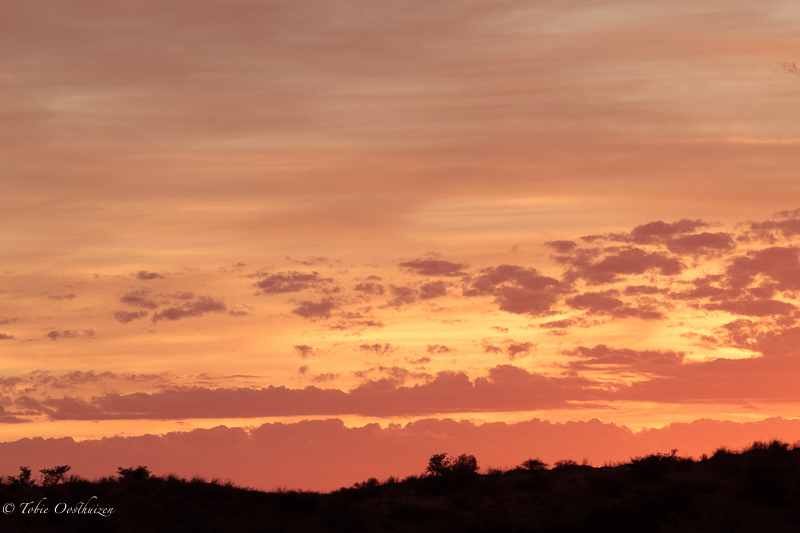 At one stage he suddenly stood up and stared towards the dunes, what can it be? 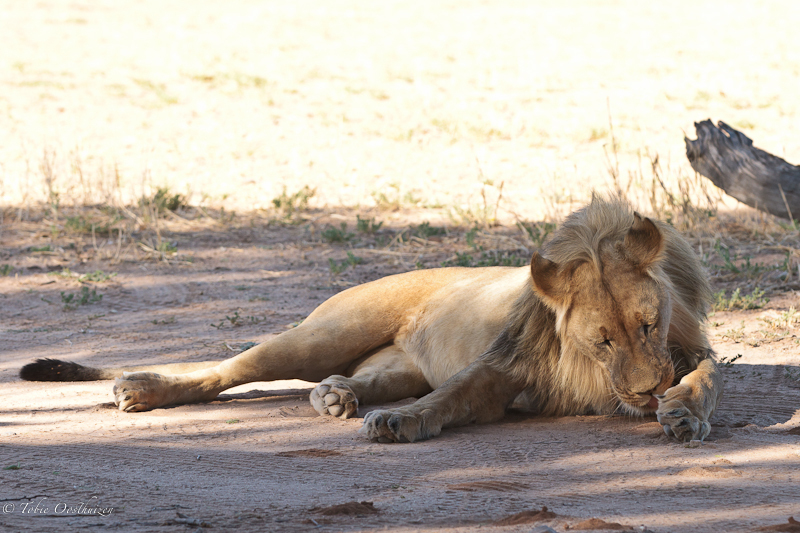 Yes the same culprit as yesterday, a Jackal… The Lion quickly settled down again and slept, groomed himself and slept some more. I (still waiting for the water drinking shot) had to move slightly a few times as the sun was now burning down. 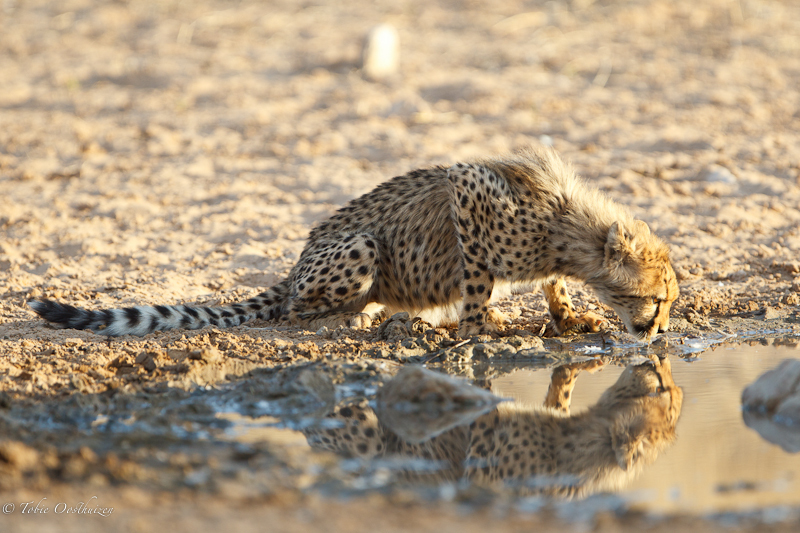 After about 90 minutes of this he at last got up and started moving in the direction of the waterhole. Yes now for the shot of the day…. How disappointing, he was not interested at all and moved to a shady spot on the dune…..
At this time I admitted defeat (strongly motivated by a overflowing bladder and growling tummy) and returned to camp. 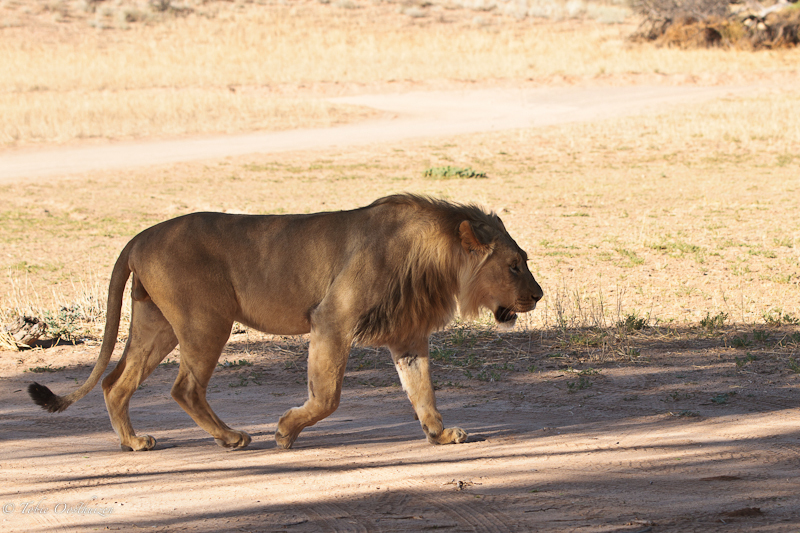 For the normal afternoon drive I decided to return to Craig Lockhardt and check if the male Lion is still around. To my disappointment there was no sign of him and the Springbok and BWB grazing not too far off were not interested in drinking either. After watching all the small birds drinking and scratching around for something to eat I returned to camp for my last braai. On entering the camp I clearly saw the thunder clouds building up. I just finished the braai when the wind really started howling and then a magnificent thunder storm with lots of lightning and rain erupted. It was really quite a site with all the lights off inside the chalets and to see the lightning flashes lighting up the downpour outside. I eventually went to bed and it was still raining.